Julie Foudy provides positive encouragement to a girl for scoring a goal. In the build up to the 2014 FIFA World Cup, Brazil still has a lot of work to do. 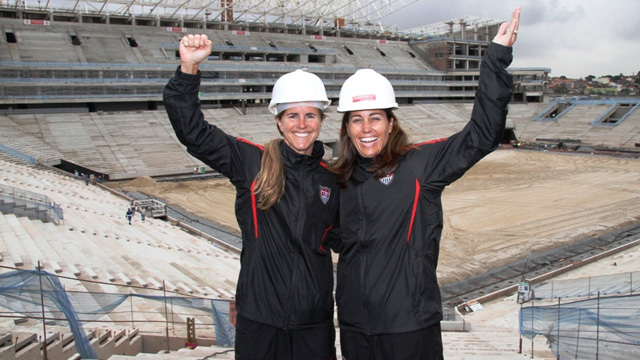 Sports envoys Foudy and Chastain visit a soccer stadium under construction. 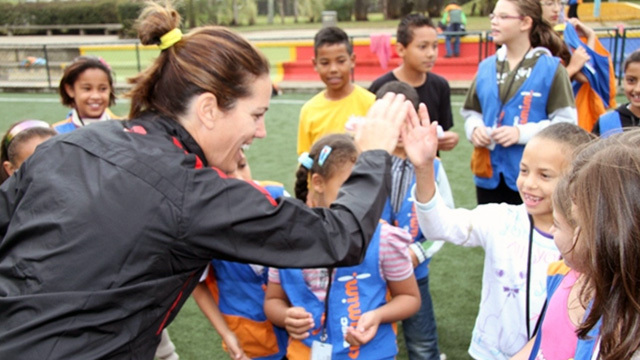 Julie Foudy shares her expert tips on kicking techniques with young female clinic participants in a neighborhood outside of São Paulo. Young female athletes work to perfect the skills and drills that they learned from Julie Foudy during a soccer session. 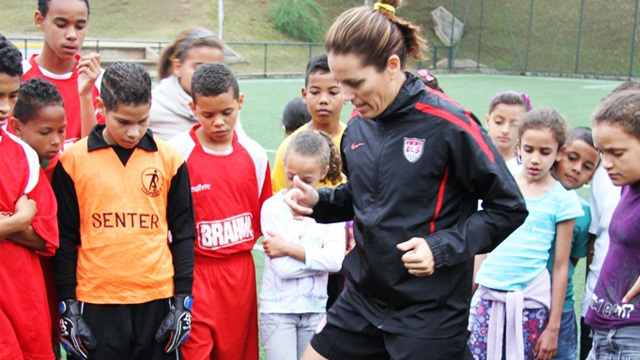 Julie Foudy demonstrates some of her favorite warm-up moves to a group of youth participants during a training clinic near São Paulo. At a “Soccer Stars” presentation, Brandi Chastain and Brazilian Women’s National Team member Rosana dos Santos Augusto speak about the health and academic benefits of sports. Throughout the program, Julie Foudy and Brandi Chastain emphasized and exhibited the importance of teamwork and communication on and off the field. 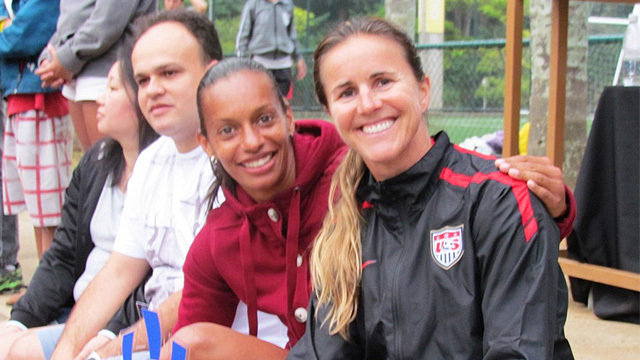 Brandi Chastain poses with Rosana dos Santos Augusto at a Soccer Festival in celebration of the positive things that come with participation in sports. 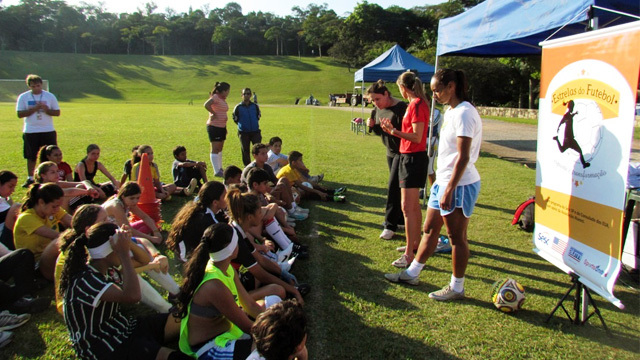 Players on a girls under-13 team take part in a clinic with the envoys, followed by a Q&A session on the differences and similarities in American and Brazilian sports programs. 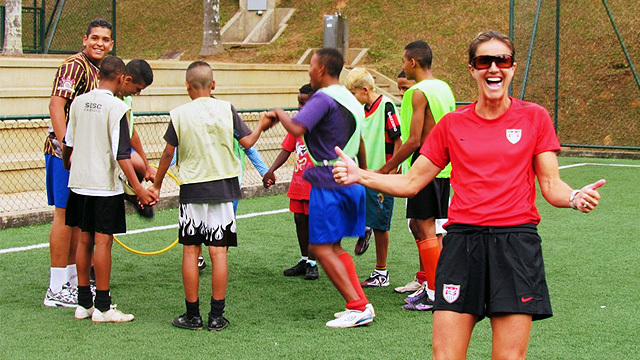 Brandi Chastain shows her enthusiasm for the teenage boys team as they engage in team building activities. Brazil is a nation of soccer, but when it comes to women and girls’ participation in soccer, the numbers tell a different story. In the United States, 14 million girls play soccer; in Brazil, only 400,000. 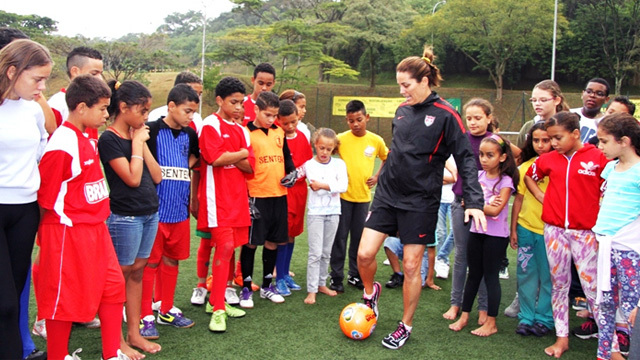 In a quest to increase the number of women and girls involved in sports, the U.S. Department’s ECA and the U.S. Soccer Federation coordinated to build a dynamic Soccer Envoy program in São Paulo, Brazil. From May 19 to 26, Olympic Gold Medalists and FIFA World Cup champions Julie Foudy and Brandi Chastain led a series of soccer clinics and sessions with young women on the importance of education, inclusion, and health. Working with the Rosana dos Santos Augusto of the Brazilian Women’s National Team, Foudy and Chastain reached out to teenage girls from different communities through clinics and speeches and worked with local P.E. teachers and university students studying sports and physical training. During their discussions with local government officials on policies that advocate for girls sports opportunities, the envoys drew on the lessons of the landmark U.S. law, Title IX.